The Department of Archaeology(DOA) has directed Kathmandu Metropolitan City(KMC) to halt the reconstruction of Rani Pokhari after a series of controversies surrounding the use of concrete in restoration process. The decision was made at a meeting attended by Director General of DOA Bhesh Narayan Dahal, KMC Mayor Bidya Sundar Shakya, Deputy Mayor Hari Prabha Khadgi and Secretary of National Reconstruction Authority on Thursday. 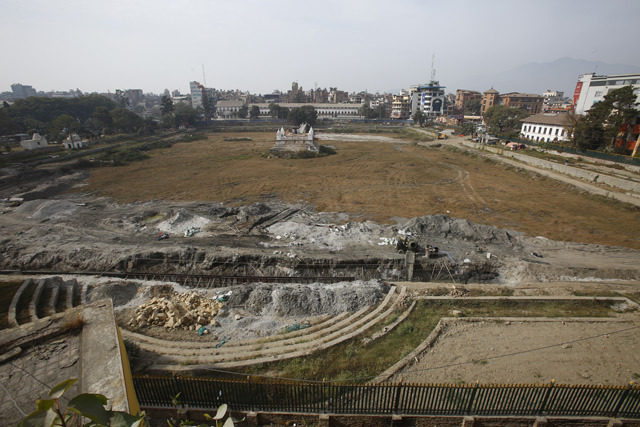 An 11-member committee has been formed under former Director General of DOA Bishnu Raj Karki to conduct a study on the reconstruction of Rani Pokhari and prepare a report within 15 days. The meeting also decided to halt the ongoing reconstruction till the report is submitted. The reconstruction of the historic pond has been mired in controversy after the KMC used concrete in building a 10-feet retaining wall on the southern side of the pond. On Tuesday locals and heritage conservationists had padlocked the pond in presence of the deputy mayor, who had promised to use her authority to stop the use of concrete in the reconstruction of heritage site. But a couple of hours later the mayor had unlocked the gates to go on a site visit maintaining that the reconstruction was being carried out as per the designs approved by the DOA. i remember the old Rani pokhari now and i miss the beauty. In the middle of the crowd Rani Pokharai looked appealing to everyone. What’s wrong with building concrete retaining wall? KMC should have built surrounding areas park like and leave the temple to be rebuilt by originalists. The way it’s going on Ranipokhari will become garbage dump site.